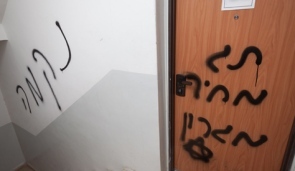 Israeli settlers defaced the home of an Israeli left-wing activist with graffiti proclaiming “death to the traitors” and “price tag Migron” on Monday, Israeli sources reported.The activist, who refused to publish her name told Israeli media that she believes this is an act to make her and other left-wing activists scared. Settlers have stepped up retaliatory attacks after the government removed three settler structures form Migron unauthorized outpost near Ramallah, last week. Palestinians have been the main victims of these acts, and apparently, left-wing Israelis are joining them. On their part the Peace Now movement said this incident is a serious one that requires emergency steps. The movement, who is know of their opposition to the presence of most of the settlements in the West Bank, believes such groups are supported by some Knesset members.